The membres of the ESPRESSO team announced that the first light of ESPRESSO with the four VLT 8.2-meter Unit Telescopes (4UT mode) took place on Saturday February 3rd, 2018. The ESPRESSO team had been granted a half night of the 4UT mode by ESO, and it started with a cloudy sky, generously offered by the Bolivian winter to test their nerves. Hopefully, at some point the sky improved and the weather officer allowed them to open the telescopes. 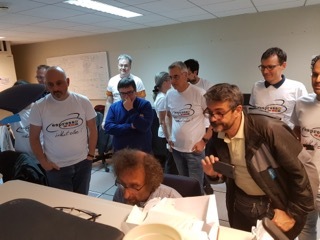 The membres of the ESPRESSO team attended the opening of the four telescopes from the platform, with the strange feeling and the pride that they were all dedicated to them for the first time. In presence of the ESO Director General Xavier Barcons, the first star observed by ESPRESSO with the 4UT mode was the so-called Pepe star. Everything worked fine and here attached are some pictures including the reduced spectrum of this first light in 4UT mode. The ESPRESSO team waiting anxiously the first spectrum. 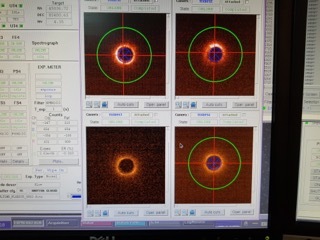 Pictures given by each of the four UTs of the VLT. 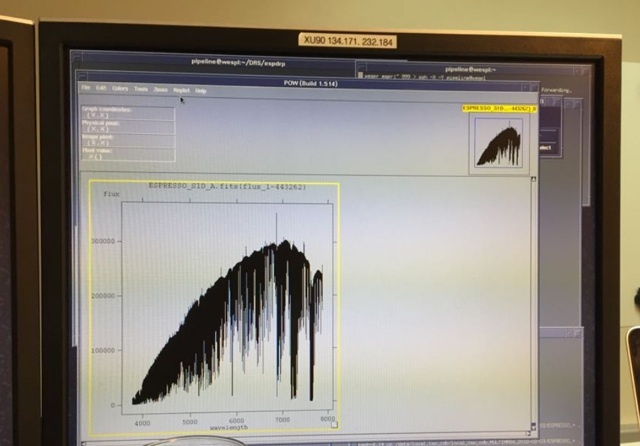 The first spectrum of ESPRESSO with the 4UT mode.